PAH is a disease of the vessels that carry blood from the heart to the lungs. In PAH, there is a constant state of high blood pressure in the vessels of the lungs. It is a progressive disease—meaning that it gets worse over time. It is not common but it affects people of all ages and ethnic backgrounds. PAH can occur on its own, or it can be related to other causes. Knowing how the cardiovascular system works will help you better understand PAH. The cardiovascular system includes your blood vessels and your heart. 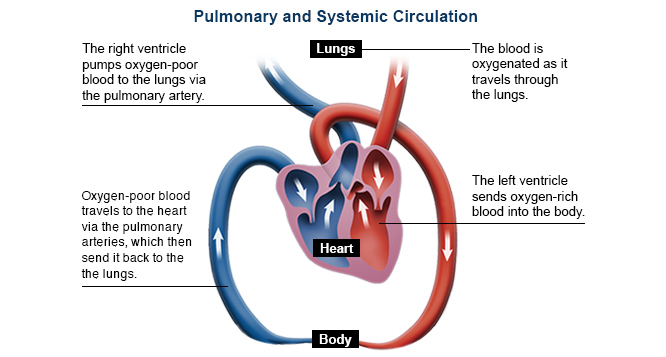 The vessels that carry blood from your heart to your lungs are called pulmonary arteries. When they are healthy, these vessels are large and flexible—this means they are very open and elastic, and blood can easily pass from the heart, through the pulmonary arteries, and into the lungs, ultimately moving oxygen out to the rest of the body. The vessels that carry blood from your heart to your lungs are called "pulmonary arteries." When they are healthy, these vessels are large and flexible—this means they are very open and elastic and blood can easily pass throughout the body. *Statement is based on laboratory studies. The clinical significance in humans is unknown. In PAH, the heart gets bigger. The right ventricle has to work harder to pump blood against higher resistance in the arteries. As the heart grows, it starts to compress its left side. This makes it harder for the left side of the heart to do its job of circulating blood to the rest of the body, in turn causing more and more symptoms to begin to appear. As this cycle continues, the strain on the right side of the heart may become too great, resulting in a condition known as "right-heart failure." This doesn't mean that the heart stops. But it does mean that the heart works less efficiently, because there is less blood flowing through the pulmonary artery.